breeding plumage, some of these birds can be a little challenging to ID. Iconic Yellow Warblers are easy to recognize with their overall yellow body and red breast streaks. But confusion can arise with some other species – many of which seem pretty similar. Magnolia and Yellow-rumped Warblers are sometimes confusing in spring – especially when seen from the rear as both of them have yellow rumps! But they can be easily differentiated by taking a look at size, other markings and where you are seeing them. 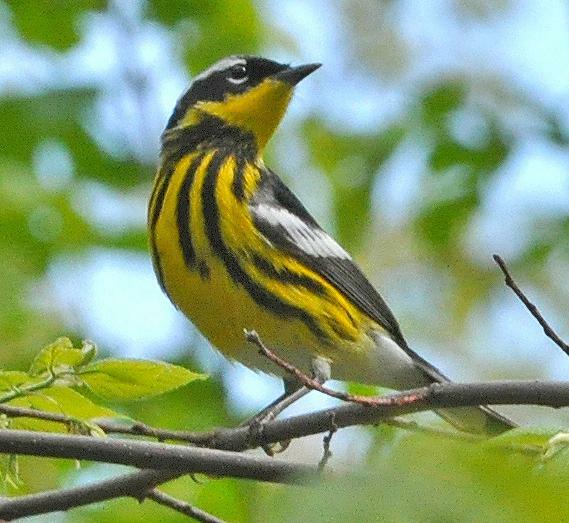 with black stripes and necklace, similar to Canada Warblers. They also have a particular white wing patch that looks like a little handkerchief. Yellow-rumped Warblers have a white throat and the only other yellow found on them apart from the rump may be on the sides in front of their wings, and maybe a little stripe on the tops of their heads. SIZE: Yellow-rumped Warblers are fairly large and sturdy for warblers, while Magnolia Warblers are smaller. LOCATION: If you are in the western part of the US, and see one of these birds, it is most certainly a Yellow-rumped Warbler as Magnolia Warblers are not typically seen in the far west. In the east, you may have been seeing Yellow-rumped Warblers throughout the winter as they overwinter in some parts of the US. But this breeding plumage for the male is a spring change to a stunning look. Yellow-rumps can be found in large numbers as well and will migrate in nice sized flocks. 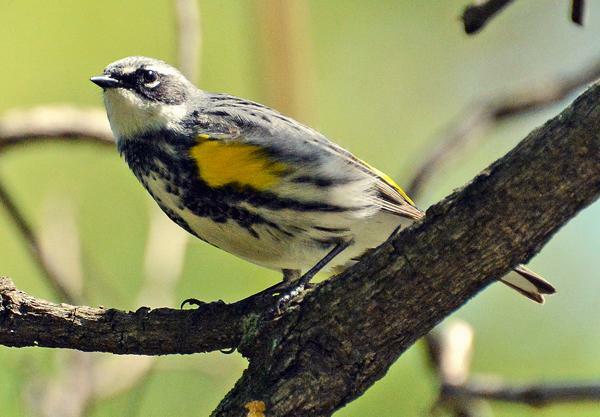 HABITAT: Yellow-rumped Warblers are found during migration feeding madly in trees and shrubs of open forests. Magnolias on migration may be in the same locations, but their preference in summer is northern forests.